Being on the same page financially with your spouse is crucial. When you get married, you change the ‘your’ to ‘our’ especially when it comes to money. As you start to share your life together, it’s easy to assume that you will naturally and openly talk about everything. But that’s not always the case when it comes to finances. This is why having a money date with your spouse can be a great way to get on the same page. My husband and I haven’t always seen eye-to-eye with finances given our different backgrounds and personalities. In order to promote healthy and effective conversations about money, we started having regular money dates. The point behind a money date is to get on the same page financially with your spouse. Studies show that over 30 percent of couples have issues with one partner hiding financial indiscretions, otherwise known as financial infidelity. Having regular meetings to discuss your financial life is a great way for both individuals to be in the know about what’s going on financially as well as help foster success as a couple. Here are some key steps to take to have successful money dates with your spouse. There’s no set rules of what to discuss so it’s important to personalize it to your needs. Whether the goal is improved communication or increased accountability, you want to make it clear so that both people understand and have realistic expectations. This is especially the case if you’ve had prior problems and want to stop fighting with your spouse about money. Consult your schedules and decide on a time and place for your money date. I recommend getting together twice a month in the beginning and committing to ongoing meetings at least once a month once you’ve become more comfortable with discussing your finances (and you’re on the same page). Some couples choose to talk weekly or every other week. This just depends on your needs and preference. Make sure you set aside 15 minutes to an hour to discuss your finances. Eliminate distractions as well. Turn off phones, TVs, and find a way to occupy your kids. If you can’t, do it after their bedtime. Sometimes, my husband and I opt to make our money dates more fun by having them at our favorite coffee shop. Our first one was at an ice cream place on a Friday night! We found that Friday evenings actually work best for us to go over our finances because it’s at the end of the busy and hectic work week but before the weekend where most of our impulse purchases sneak in. Your next step is to choose a list of specific topics to focus on. Just like with other meetings, you want this one to have a clear focus and address any pressing topics. Brainstorm any issues or concerns you have or financial goals you have for the future. Your money date is the perfect time to express what’s been on your mind, what you’ve observed lately, and any struggles you may be having personally. I like covering the topics above as they’re a major part of being financially stable and provide us a clear path to follow. Once you get into the discussion, it’s important to remember to use your words wisely. While your money date should provide an open arena to discuss your thoughts and concerns, you don’t want it to turn negative. Don’t hold back from sharing your honest opinion but realize that how you say it can be very important. You don’t want your partner to feel like you are attacking them. This can lead them to becoming defensive and putting up a wall. It’s important to show empathy even if you’re trying to persuade them to see things how you see them. Also, don’t just focus on dumping all your baggage onto the table. Be open to listening and processing everything that your partner is saying. That way, you can use your money date as a stepping stone to generate financial progress. After you’d laid everything out, went over all your updates and talked through your key topics, be sure to work on coming up with a reasonable solution or action steps to take moving forward. For example, if you discussed some impulse purchases you and your partner made that prevented you from meeting your monthly debt repayment goal, work together to create a plan to stop impulse purchases going forward. If you set a really aggressive savings goal, talk through which expenses you might cut or reduce to help you reach that goal. You can use a tool like Trim to help you reduce these expenses. Trim is free to use and they cut subscriptions you no longer use or negotiate bills, helping you save money. After you discussed your solutions and action steps, plan the next money date on your calendar. The best thing about having a money date is that they are great for accountability. It’s the perfect time to hold your spouse accountable and follow up to make sure they’re doing what they said they would do. It’s easier to meet goals when you have an accountability partner cheering you on and providing support. My husband and I used our money dates to be accountable for our house down payment savings goal in recent months. We each decided to put a specific amount of money toward our down payment fund so we regularly check in with each other and provide updates during money dates. If issues or setbacks arise, we work on solving them together. When done correctly, these meetings can help improve the way you and your spouse talk about money and manage it as a team. It gives a way to have safe and productive conversations that lead to actionable solutions and positive results. If you haven’t already, talk to your partner about having a money date or find ways to improve your current situation when it comes to talking about money. 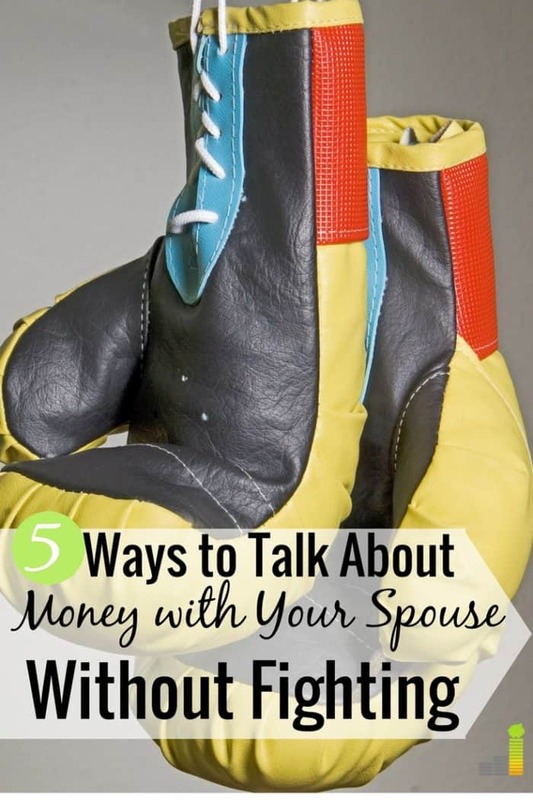 How often do you and your spouse talk about money? What are some of the other financial topics you discuss during this time? Do you and your spouse have a set amount you can spend without having to get approval from the other partner? The post How to Have a Money Date With Your Spouse: 5 Ways to Get on the Same Page appeared first on Frugal Rules.